Creating an engaging movie takes three elements - a high and constant frame rate of capture, an interesting flight path and a suitable sound track. With these in mind you can make a movie from either Google Earth or Microsoft's Virtual Earth in under 15 minutes. 1) FRAPS - FRAPS is without doubt the best way to capture what you see on the screen in realtime from either Google, Virtual Earth or any game/virtual environment that uses DirectX or Open GL - this includes Second Life. 2) Space Navigator - If Fraps is the most useful software we have purchased recently then the Space Navigator is the best, and cheapest, hardware. Priced at $59 , £39 or 59 Euros the Personal Edition of the Space Navigator allows you to create smooth flight paths in both Google and Virtual Earth, it also works in many other 3D packages. FRAPS uses a hotkey to start recording - press your assigned HotKey (ours is F12) and start to fly around your scene. It is best to try out your flight path a couple of times before recording to ensure it is smooth and the required textures are preloaded. To add to the location we used the sound of a helicopter in flight from here which is subsequently imported into Movie Maker and dragged into the movie clip bar as many times as required to play throughout the clip. The sound trails off towards the end so to ensure a continuous sound effect each clip is overlapped - as pictured above. 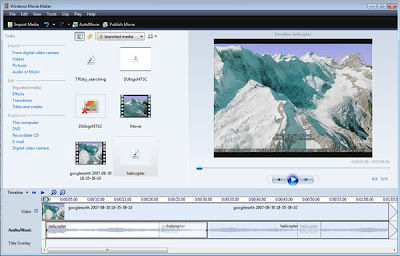 Movie Maker only allows one audio track to be added - as we mentioned its a low end editing tool - as such the movie needs to be published and reimported if another sound track is to be added. While this is a 'quick and dirty' method for creating movies it hopefully illustrates how to make a movie which is more engaging that your standard screen capture. The quality of Google's imagery for the Swiss Alps is approaching realism, making it perfect for educational use in physical geography. I haven't done the first thing with video yet, so I really appreciate you posting this for us. Thanks. Its fiddly especially if you are moving the camera at the time but works well enough that users don't suspect anything. No joke: This morning on my commute I thought to myself. "How does one make a nice smooth flowing animation in Google earth"
Useful info Andy, thanks for this. I've made some comments on my blog about audio and the Space Navigator. Very informative!!! Thank you soooo much for posting this, I have been fumbling through the google earth movie making on my own, with limited success. Have you ever tried Camastia Studios software? I ended up buying a license (about 31 days before their major upgrade... which I cannot access unless I give them more dough) specifically so I could record google movies. Their software allows some rudimentary editing features, such as a soundtrack. I just wonder if there's any need to try fraps if I have camastia (which seems to be much more robust than fraps-- and way way more pricey, dammit! ).